Papilio user Fantasma25 has designed a new audio DAC wing and decided to share his work with us on the forum. 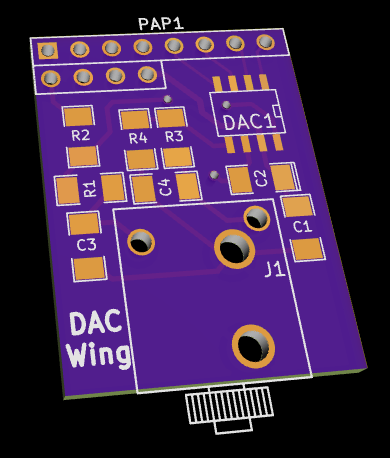 The new wing It’s based on the MAX5556 DAC, it has an I2S-compatible interface and up to 50KHz sampling rate which is perfect for standard 44.1 and 48 KHz sampling rates and a resolution of 16 and 24 bits. The board does not contain any output buffer as I wanted the board to be as small as possible. It only has the MAX5556, a couple of passives and a 3.5mm stereo jack. For more details including the source files and schematics please drop by the forum thread here and join the discussion, any help or idea is greatly appreciated. Next PostNext People’s Hall Pictures!